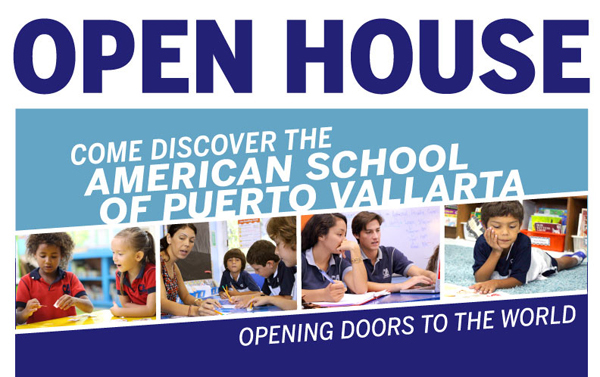 On Wednesday, February 11, 2015 from 10:00 am until 1:00 pm the American School of Puerto Vallarta will open its doors to families in Puerto Vallarta and surrounding areas to discover why it is the best educational institution in the region. We want families to LIVE the American School experience, so instead of a typical presentation we’ve set up a self-guided tour for visitors. There will be 11 stations in all, each one representing an important facet of our school. Families can choose to visit some or all of the stations we’ve prepared, see classrooms in action and talk to teachers, department heads and students. Visitors completing the route will receive a surprise gift at the end of the tour. The American School is located in Marina Vallarta at Albatros 129. The event is free of charge. For more information visit American School PV online, email camerica@aspv.edu.mx, or telephone (322) 226-7672.